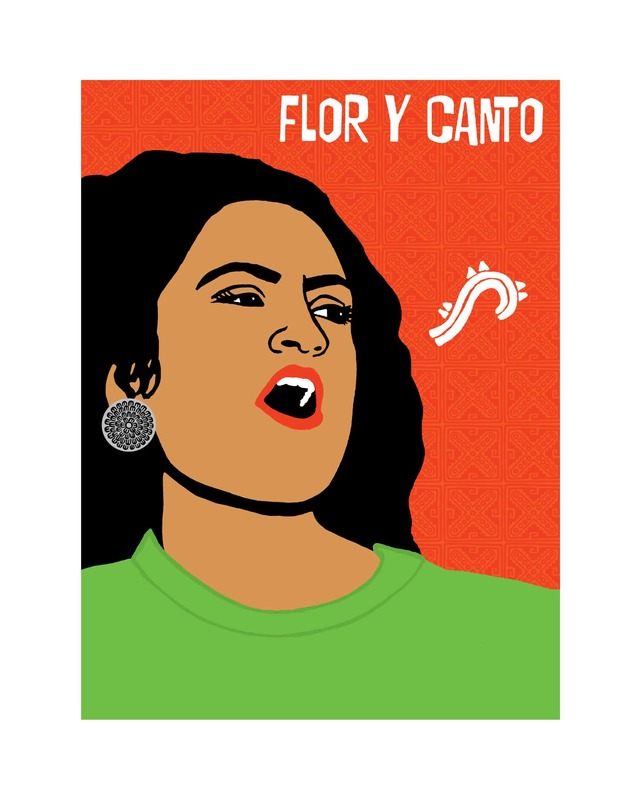 Melanie Cervantes is a Xicana graphic artist who creates images that reflect the hopes and dreams of social movements and catalyze people to action. Melanie’s work includes black and white illustrations, paintings, installations and paper stencils, but she is best known for her political screen prints and posters. Employing vibrant colors and hand-drawn illustrations, her work moves those viewed as marginal to the center — featuring powerful youth, elders, women, and queer and indigenous peoples. Melanie has exhibited at Galería de la Raza (San Francisco); Woman Made Gallery and National Museum of Mexican Art (Chicago); Mexic-Arte and Guadalupe Cultural Arts Center (Austin, TX); and Crewest (Los Angeles), among others.For more information visit: www.dignidadrebelde.com. In the Chicano movement the tradition of reading poetry and literature for and by the community has been a platform for individual and shared experiences. This portrait of a woman who has a speech scroll floating out of her mouth represents the power of the word, the power of poetry, and the power of that utterance. Further, In xóchitl, in cuícatl honors the tradition of flor y canto (flower and song).